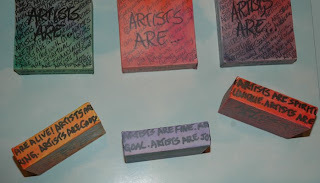 I have created some fun canvases from the 'reframed' blurts we made at the Artist's Way 'Jump Start' workshop. 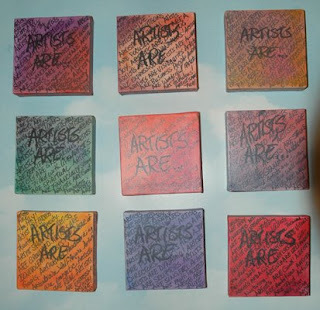 Filled with positive statements about Artist's, my canvases are a conversation peice and reminder that we are wonderful people! Those negative statements will now be changed forever with these little charms to hang on your wall. Buy full set for $450 or $50 each.